The room went cold when the Zelda team approached Miyamoto with its initial idea for Legend of Zelda: A Link Between Worlds. 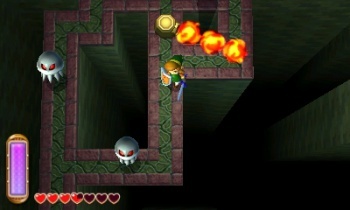 Before the team had pinned down the current idea for upcoming Legend of Zelda: A Link Between Worlds, the game had a vague theme of communication. Presenting this idea to Miyamoto, the Nintendo veteran lay down a harsh ruling: "This sounds like an idea that's 20 years old." Originally, A Link Between Worlds was going to be an extension of the DS Zelda games, using an angled overhead perspective, and Link had a Toon Link design. It wasn't until a later brainstorming session that the team chose to add Link's ability to enter walls. A Link Between Worlds was put to rest for development of Skyward Sword and Wii U launch titles. Producer Eiji Aonuma revived the project on his own while other team members were busy. Kentaro Tominaga, assistant director and plan leader, created some dungeons using the wall-entering ability just for Miyamoto to tear apart-again. At this point, Miyamoto suggested tying the game into A Link to the Past. This is what led the team to use the top-down perspective. The game went through months of tweaking, and core team members had to persuade others to give serious consideration to new additions, such as the game running at 60 frames per second and the designing of the world based on A Link to the Past. "The ones who undertook [rethinking conventions] were younger developers," Aonuma said, "and during development, I often exclaimed, 'We can do that?!'" Legend of Zelda: A Link Between Worlds launches for 3DS Nov. 22.